Most people don’t really think about walking in sandals for thru-hikes. Except for walking in very wet or very cold conditions or you plan to climb …sandals most of the time prove as a better choice. Most people do not get any blisters in sandals. Blisters come from a combination of friction, moist and heat. In sandals all that is reduced to a minimum. 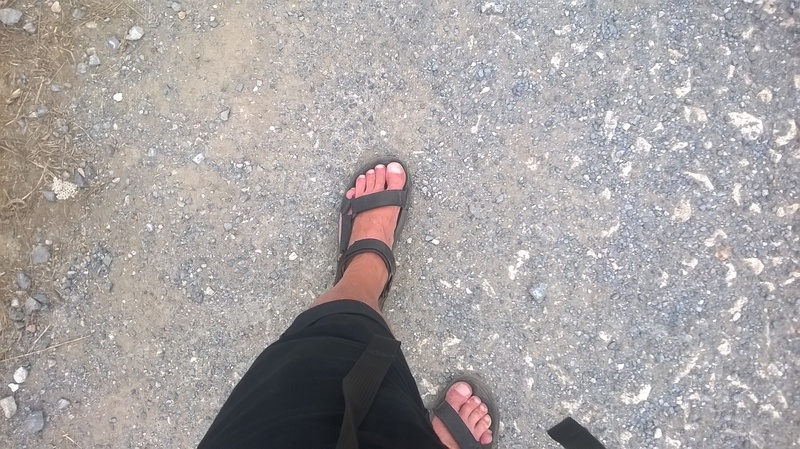 Furthermore sandals are a lot lighter and easier to move and you use a lot less energy. You save weight …about 2 kilo compared to walking boots. In summer conditions with low expectations of rain you can even go without rain pants and gaitors if you are using a rainponcho to keep your torso, backpack and shorts dry. The best sandals I’ve come across is Ecco Offroad and Teva Terra Fi Lite Leather. Ecco Offroad is definitely the most comfortable and durable sandal I’ve come across with no comparison. Teva Terra Fi Lite Leather is Teva’s model that comes closest, without being too heavy or bulky.